At the end of “Maze Runner: The Scorch Trials,” Thomas (Dylan O’Brien, “Deepwater Horizon”) and his friends have finally found solace in the mountains with a resistance group known as the Right Arm. Teresa (Kaya Scodelario, “Pirates of the Caribbean: Dead Men Tell No Tales”) reveals to Thomas she has betrayed them and their newfound safety, having notified WCKD about their location, and in the chaos that follows, many immune are recaptured, including Minho (Ki Hong Lee, “Wish Upon”), while Teresa boards the WCKD transport alongside Ava Paige (Patricia Clarkson, “Learning to Drive”) and her righthand man, Janson (Aidan Gillen, “Sing Street”). Maze Runner: The Death Cure picks up six months later with Thomas leading a rescue mission in the desert. Jorge (Giancarlo Esposito, “Money Monster”) and Brenda (Rosa Salazar, “CHIPS”) distract WCKD’s men alongside a train transporting immune children to an undisclosed location, while Thomas and Vince (Barry Pepper, “The Lone Ranger”) liberate the passenger car with the help of Newt (Thomas Brodie-Sangster, “The Last Legion”) and Frypan (Dexter Darden, “Joyful Noise”). Back at their home base, a broken-down shipyard, they find that Minho is not among the captured, and Thomas vows to get him back. They head towards The Last City, a fortress surrounded by an impenetrable wall, shells of destroyed buildings, and desperate infected people. Inside the city is WCKD’s laboratory, where Ava Paige and Teresa strive to find relief for the infected; Teresa uses Minho’s blood to manufacture a new serum she hopes will overpower the virus, known as the Flare, and, still tormented by her betrayal, clings to her hope that those sacrificed along the way will not have given their lives for nothing. As Thomas gets closer to the wall, he is spotted by a surveillance drone and Janson refocuses his energy on capturing Thomas before he can ruin any more of WCKD’s plans. 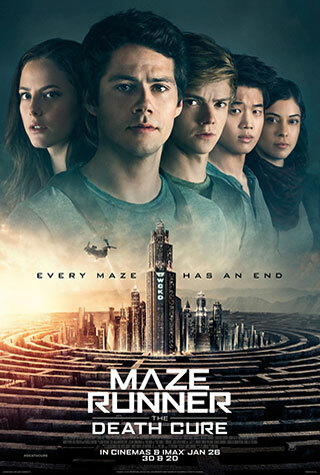 The final chapter of the novelist James Dashner’s Maze Runner series comes to a close with Maze Runner: The Death Cure, a film that was delayed a year due to star Dylan O’Brien’s injuries suffered on set. The film is exciting and action-packed, and includes some touching moments and even a small surprise, bringing the trilogy to a relatively satisfying close. In general, Dashner’s story was kept mostly in tact, unlike some other page-to-screen adaptations; however, there are only so many zombie attacks and shooting scenes and deus ex machina saves you can tolerate before you start wondering why a film needs to run close to two and a half hours long. The first film, “The Maze Runner,” was filled with fascinating characters whose stories unfolded alongside the intrigue of a puzzling and dangerous location. Once those characters were developed and relationships created, they didn’t advance much further, and in “Maze Runner: The Scorch Trials,” audiences were left with the mystery of WCKD itself. That film worked, however, as viewers were still caught up in WCKD’s motivation and worried that Thomas and his friends wouldn’t make it out of the scorch. Teresa’s betrayal at the end was shocking, but in Maze Runner: The Death Cure, most of WCKD’s evil has grown pretty ho-hum. Scodelario’s Teresa is supposed to embody the the idealism of medical research, holding onto the pure idea that WCKD is good and can save them all, but she’s really little more than a plot point used to get Thomas running and battling bad guys again. Ava Paige, played by the typically electric Patricia Clarkson, has completely deflated from the determined shot-caller she was in the first two films. Anything potentially diabolical about her has been drained, and her white costume suggests a ghost of her former self rather than a medical dynamo who will stop at nothing to succeed. Gillen’s Janson, as relentless as the Terminator in film two, is terribly bland in number third; he’s turned into a disappointing caricature of a PG-13 bad guy. Maze Runner: The Death Cure is, however, a sufficient wrap-up to a trilogy rushed to the screen in an attempt to reach the heights of “The Hunger Games” series. While only the first film holds up enough to warrant repeat viewings, at least we’ve gained appropriate closure from this dystopian trilogy, unlike “Divergent,” which strayed so far off the tracks, it seems its finale, “Ascendant,” may never see the light of day. At least we can be thankful that the choice was made to keep the three Maze Runner books contained to three films, and perhaps the future of young adult films can stick to quality stories and characters — after all, young adults are Hollywood’s biggest demographic. Give them something good, huh?